These two energetic and loving souls celebrated ten years of marriage this year- just breathe that in for a moment. Ten years of loving each other, celebrating each other’s victories, going on adventures and learning the world together… I could go on forever. A Paris anniversary session at sunrise was hands down the best way for them to celebrate their relationship! 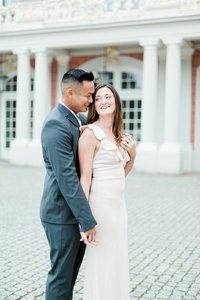 Nick and Kim’s smiles and laughter were absolutely contagious, and they made the city seem all the more romantic with their genuine interaction throughout the photos. Countless times I guided Nick and Kim into a pose, and they would share some words, giggle into a more comfortable version, and be so relaxed and in tune with each other. It made me absolutely giddy to lay a foundation and watch a couple take the pose and make it their own. And their photographs reflect them so well because of it! I have to tell you, there are a few frames of completely relaxed expressions, no smiles whatsoever… those photos just don’t do them justice! Capturing photographs that are true to your relationship is so important to me. Nick and Kim, thank you so much for traveling to Paris and allowing me to document your love for each other in my favorite city! When you inquire you’ll read more about ‘why Paris’. It’s important that you understand how special Paris is to me and how special I make it for you. Paris is where I found my traveling independence, my excitement for cities beyond my own, and where I found inspiration for my photography. So, of course, it’s the city I want to take you for an anniversary experience you won’t forget! I remember walking along the Seine for the first time, and the second, and the third. Then years later walking along the same Seine, getting the same butterflies, only experiencing it with Teylor and Greyson, too. Now, I take couples there and experience the city with them as well and simply put- I have the best job ever! Paris has inspired so many parts of my business. It’s inspired my print shop, La Keepsake Shoppe. It’s inspired formally offering Paris Anniversary Sessions and making it an incredible experience for you. One that I would want if it were my very first time in the city. It’s inspired posing for all my anniversary sessions and during wedding days. Paris has helped me to define my business in so many ways! Je ne sais quoi streets! Do you have a special place in Paris? Maybe a special date your husband took you on? A memorable part of your life that you’d love to celebrate in addition to your anniversary? Or maybe a location from a photo you’ve admired from afar for years. I adore when my couples choose a location that is meaningful to them. 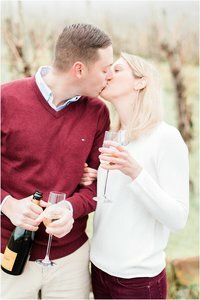 It truly adds so much to your Paris anniversary session photographs! During the summer months, the early sunrise is the most beautiful part of the day. The sky is blue and pink, the tourists are tucked away in their hotels, and you and I are left with a quieter more intimate Paris to experience. I know it’s early, but it is well worth the effort to get clean photographs of the areas of Paris you most love. 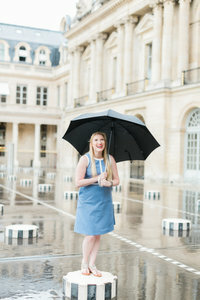 You deserve the best Paris anniversary session and part of that equation is sunrise! Did the very first photo on this blog post catch your eye? That’s because it is actually 22 photographs meticulously stitched into one panoramic like photo. By putting multiple photos together I can capture an entire scene during your Paris anniversary session rather than just a snippet. It requires you and your love to hold your pose for about 2 minutes, but it’s so very worth it! I shoot for my Signature Portrait at each of your locations so you can have a signature image that gives you a more robust feel for the location among your gallery. For example, if you have three locations during your Paris anniversary session you’ll receive three of my Signature Portraits within your gallery. I intend for these portraits to be the conversation starters in your life. These are my absolute favorites for canvases or other large-scale wall art. While your gallery is filled with details, loving moments, and overall scenes I want my Signature Portrait to bring all those photographs together. I hear a ‘ding’ alerting me to an excited email telling me all about your marriage and your relationship with Paris. I soak it up with my second, or third, cup of coffee and giggle to myself about getting to know you two further as I email back to set up a Skype date. We video chat and talk about all things including your vision of your Paris Anniversary Experience. We click, and I just know you’re going to love the genuine anniversary photographs that will result from our instant friendship and the comfort and trust you two place in me. Over the next several months we become fast friends and plan your Paris Anniversary Experience. Then the morning approaches! We arrive in the City of Lights, meet and photograph the perfect session. But the experience is nowhere near ending there! Ready for your perfect Paris anniversary photographs? Let’s do this! What a beautiful session, I just love all your work! They look so happy and in love. OMG OMG!!! This is soooo gorgeous!!! Eeek! In Paris?! Envious over here! Love all of these. Posing spot on! The colors in your images are so beautiful! And I love your Signature Portrait! Yes yes and yes!! I am dying over these, I love the location, it’s breathtaking. Summer of 2020 I am making a trip to france, it’s somewhere I’ve always dreamt of going. More to see the countrysides, but seeing these now. I am going to have to go here! OH. EM. GEE. These are stunning. Absolutely in love with the colors and tones! You did such a great job! Jeannie, you’re too sweet! Thank you <3 I loved captured Nick and Kim in Paris SO much! My goodness! These are breathtaking and I can’t wait for our session together this summer!